In one of the most interesting and elegant corners of Rome, between Piazza Barberini and Piazza di Spagna, we offer the perfect place to stay in Rome: Hotel Sistina. This small hotel seems to be the right place to take a rest after a full day in the city, after your shopping in the centre or a cultural visit of historical Rome. The nice location, the quiet surroundings and the friendly employees, are already waiting for you. Descriptionclass="small" style="text-align: justify; font-size:11px;">In one of the most interesting and elegant corners of Rome, between Piazza Barberini and Piazza di Spagna, we offer the perfect place to stay in Rome: Hotel Sistina. This small hotel seems to be the right place to take a rest after a full day in the city, after your shopping in the centre or a cultural visit of historical Rome. The nice location, the quiet surroundings and the friendly employees, are already waiting for you. Stayed 3 nights in this hotel. First impressions: brilliant location (5 min walk to Spanish Steps), comfortable reception area with friendly staff, small Lift (4 persons max), very dated decor and very bad odour in corridor around the Lift (which didn't evaporate during our 3 night stay). 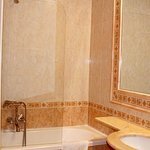 The positives are you will have a great big comfortable bedroom complete with good shower and plenty of hot water (but minimum of toiletries). There is an adequate continental breakfast with plenty of ham/cheese, yogurts and not so fresh fruit! Not so fresh bread rolls too depending on what time you come down for breakfast! I don't know where the bar is (unless you consider the few bottles of alcoholic drinks behind the coffee machine). The breakfast staff could do with being a bit friendlier but this isn't a deal breaker. There is a roof top terrace mentioned on the hotel's website but we weren't given any information on this on arrival so don't know if it exists or not. Overall the location is what sells this hotel, not its staff and not its breakfast. I would consider staying again but figure there must be better 4* hotels in this area. Thanks for your review, we will do our best to improve the negatives and we hope to host you again soon. Ended up at this hotel due to an issue with Expedia when our original hotel closed last minute. All I can say is that if I had booked this as my first choice I would not have stayed. While the hotel is in an ideal location to see all the sights, the hotel is very old and â€˜tiredâ€™. â€˜Ripe for developmentâ€™ is the best way to describe it. The rooms are large with big bathrooms and a walk in wardrobe with safe. The bed was clean and comfortable. Breakfast was adequate and the staff were pleasant. There was also no bar (despite this being on the website) and although there was a kettle(which didnâ€™t work) there was no milk provided. I would in no way describe this as a 4 star hotel. Thanks for your review, we will do our best to ammodernate the hotel. Location of this hotel is superb. Minutes from Spanish steps and a few more to the Trevi Fountain. It's a little old, the carpets smell musty, and the furniture is outdated, however, it does have some Italian charm (my room at a picture of the Virgin Mary over my head...love it!) It has all the comforts needed when you just need a hotel to sleep and shower. The window view was to the Via Sistina. Price was very reasonable. I'd stay again! Best value for breakfast : served on time in the room : for 9euros per person you have a full choice of delicious meals that enables you to eat all the day if you want. For Families, lovers and... lovers. We styed for three nights, Great location , stuff are very friendly , thay halp us on late chackouy , comfortble transfer from/to airport , small roon but clean,breakfest was very very continental and very limited. Thanks for your kind review, we are sorry you didn't like our continental breakfast that currently consists in 2-3 types of ham and cheese, eggs, salad, cereals, yogurt, fresh fruit, bread, butter, jam, croissants, cakes, juices, etc. and hot beverages. We will do our best to improve it.